Chipotle's Famous Giphy® Stickers now available IRL….and they're Scratch & Sniff! NEWPORT BEACH, Oct. 10, 2018 /PRNewswire/ -- Chipotle Mexican Grill (NYSE: CMG) is celebrating 100 million views of its digital Giphy stickers by bringing some of the most popular stickers to life in the form of limited edition scratch and sniff stickers. 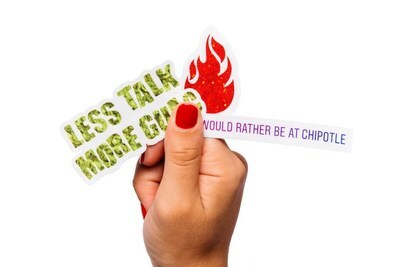 Available now for purchase on Chipotle.com, the stickers are real-life designs of some of the most-used Chipotle Giphy stickers on Snapchat and Instagram: "Would Rather Be At Chipotle," "Less Talk More Guac," and "Salsa Flame," which feature scents of smoky adobo, roasted cumin, and flaming chili, respectively. "We've seen tremendous enthusiasm for the Chipotle Giphy stickers since they launched on Snapchat and Instagram, and love that these give people the freedom to express themselves in creative ways on social media," said Tressie Lieberman, vice president, digital marketing and off-premise at Chipotle. "As we continue to push the bounds on digital and social innovations, we're also seeing a demand to bring many of these digital experiences into 'real-life,' which is why we wanted to create these fun, real-life scratch and sniff stickers for our fans." Chipotle was one of the first major brands to launch stickers on Giphy in June 2018. The company worked with designer and Instagram pro, Pablo Rochat, to create highly engaging designs that were inspired by popular fan conversations found across social media. Chipotle leveraged learnings from the early experimentation to create a Sponsored Sticker Pack on Snapchat. Chipotle continues to experiment with Giphy stickers to promote new products and insider Chipotle tropes, most recently it launched a new sticker, along with the Snapchat Sticker Pack, to celebrate National Guacamole Day and the launch of its large-sized guacamole side. Chipotle plans to continue to expand its offering of Giphy stickers and its next app update will allow customers to easily send Giphy stickers via SMS. For more information on the scratch and sniff stickers, please visit Store.Chipotle.com. Giphy is a registered trademark of Giphy, Inc., New York, NY.